Discussion of hot air ballooning issues and trends. Sharing the magic of hot air balloon flight. 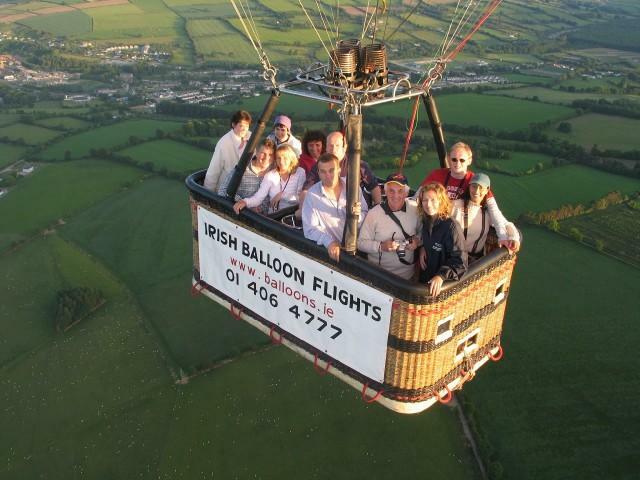 Sharp inflight photos are used by balloon ride operators to convey the astonishing position a flight actually puts people in. There's no way for the passengers to get a shot anything like this. Some companies provide these pictures as a value added service, and many sell them after the flight. Much in demand, they make a nice little profit center - there's nothing better to show the folks back home just what you did. So, how's it done? Several methods are used: some pilots have a telescoping pole the camera is mounted on. Others mount a small camera on a gooseneck attached to the burner frame. This can be adjusted inflight to point wherever is desired. The best photos seem to come from suspending the camera from the balloon by small cords and using a remote control to activate the shutter. See the inflight balloon photo above. Malcolm White, of Irish Balloon Flights, describes this system as having D-rings sewn onto the balloon's load tapes about 20 feet up, from which are hung 2 elastic cords, tied together at the bottom with loops 4 inches apart. On the loops are spring clips which attach to tie-wraps on the camera strap fittings. This gives the ideal angle for the shot, and keeps the camera far enough from the basket for a dramatic photo. A thin black nylon thread is used from the bottom of the cords to the basket to recover the camera before landing. The thread is essentially invisible. You can see the full size photo, one from another angle, or additional pictures of balloons of all sorts. These events are very very memorable and feels joy and happiness. May I know the manufactuerers in India. What makes balloon flight special?